A portion of I-270 northbound was closed for several hours Thursday after a disabled car was struck from behind, killing the driver. Someone called police just after 2:30 a.m. to report a disabled Toyota Yaris in a travel lane along I-270 north near MD 121 in Montgomery County. Police say the driver of that car had a flat tire and stopped in the travel lane rather than the shoulder of the road. A short time later, police received a call about a collision in the area. The driver of a Honda Accord, Samantha Sterling, 33, of Frederick, struck the rear end of the Yaris, killing Norman D. Bennett, 79, of Montgomery County, police say. Bennett died at the scene. Sterling was transported to the hospital with non-life-threatening injuries. Police do not believe alcohol is a factor in the crash. 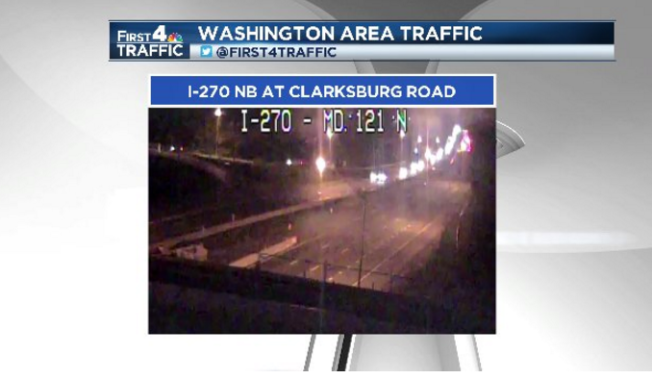 I-270 northbound reopened just after 6 a.m. The investigation into the crash is ongoing.